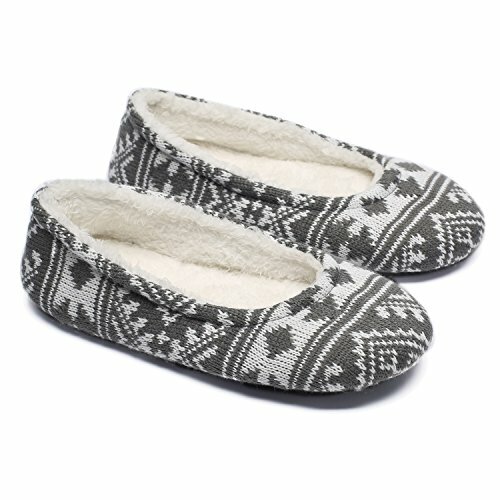 BALLET STYLE & CASHMERE SNOWFLAKE PATTERNS UPPER："Ballet" style slippers,catch your eye due to cute design,knit cashmere material with snowflake pattern ,unique,warm and comfortable,suit for winter spring and autumn wearing. COLOR CHOICE & SIZE OPTIONS: Three colors are all good choice: Black,Grey and Coffee. Three sizes cater to different needs,make you foot stay on without being too tight:Size S (suit for US 5-6, UK 3-4, EU 36-37) = 9.3" (23-24cm),Size M (suit for US 7-8, UK 5-6, EU 38-39) = 9.8" (24.5-25.5cm) ,Size L (suit for US 9-10, UK 7-8, EU 40-41) = 10.4" (26-27cm). SOFT VELVETEEN INSIDE & EVA PADDING INSOLE: Highly recommend cotton veleteen lining,really warm and super soft inside,make your feet stay nice and toasty. EVA padding insole, environmental,spongy and not easily deformed.You can wear them all day around the house. TPR OUTSOLE & LIGHTWEIGHT : TPR bottoms sole last longer,offers you an anti-slip protection,suit for indoor wearing,also perfect for step out occasionally. Light-weighted slippers are easy to carry, very suitable for wearing in bedroom, SPA, hotel, plane and train.Soft foldable sole is convenient for carry anywhere with you. PERFECT AFTER-SALE SERVICE: WASHING INSTRUCTIONS:Handwash Perfectly ,No Tumbledry,No Iron, No Bleach, Natural Air Drying. 100% no risk money-back guarantee if you are not satisfied with your purchase. Just contact us and we will give you the most satisfactory solution.